Eleven miles of the waterfront bikeway have been planned. Your three miles have not. Come out and make it happen! Creating a dedicated bikeway parallel to the waterfront will be a challenge. It is also a unique opportunity to demonstrate new principles for urban transportation and design that encourage non-motorized transportation. A successful outcome will be historic for New York. Your voice and your ideas are needed to make it happen. Register today at info[at]brooklyngreenway.org. Space is limited. Get a glimpse of the vision in this clip from the "Fifth Annual Future Brooklyn Waterfront Greenway Bike Tour". A free beer tasting will follow the workshop! Saturday, May 19, 11:00 a.m.
Sunday, May 20, 10:15 a.m. - 3:30 p.m.
Reservations and prepayment required. RSVP to rsvp[at]mas.org or 212-935-2075. Box lunches and all admissions are included in tour price. Join residents and organizations of Greenpoint and Williamsburg to help shape the plan for the Brooklyn Waterfront Greenway. 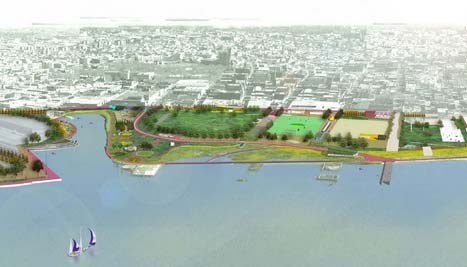 Many elements of the greenway are provided for in the Parks Department’s Waterfront Master Plan for Greenpoint-Williamsburg. This workshop will consider those elements which are not yet programmed. 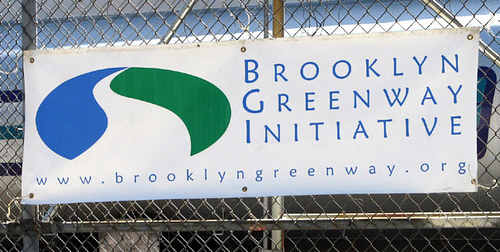 Brooklyn Greenway Initiative and Regional Plan Association will provide background information and studies to support the discussion of planning options. Participants will break into groups with maps, aerial photographs and diagrams to brainstorm, explore possibilities and achieve consensus on route location, configuration, design features and user facilities. 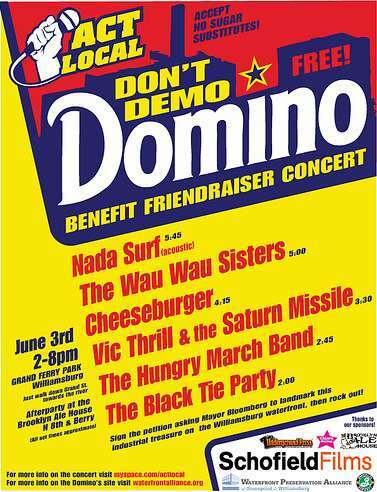 Another great concert event is coming up - the Act Local Don't Demo Domino concert at Grand Ferry Park. 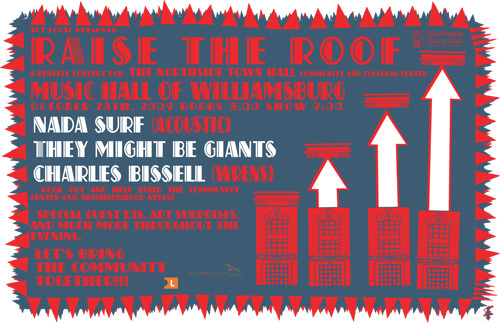 The event will held on Sunday, 3 June, from 2:00 pm to 8:00 pm, and features music by Nada Surf, The Wau Wau Sisters, Cheeseburger, Vic Thrill & the Saturn Missile, the Hungry Marching Band and The Black Tie Party. The event is sponsored by SchofieldFilms, Brooklyn Brewery, Underground Press, the Brooklyn Ale House and Chiara Sullivan. And best of all - its all free! 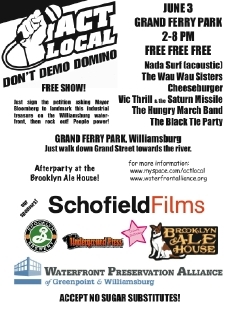 Act Local only asks that you sign WPA's Don't Demo Petition in order to enjoy an afternoon of free music. And afterwards, join us at the Ale House for the afterparty. Monday, May 28, 10:30 a.m. - 1:00 p.m. 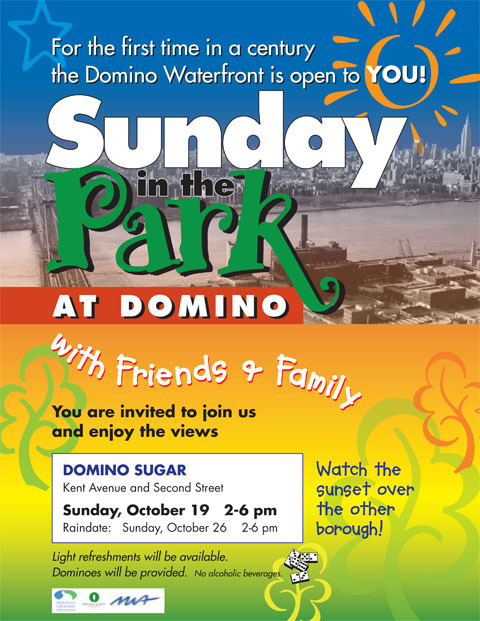 Walk to Grand Ferry Park and listen to music - support the preservation of the Domino Sugar Refinery. Sunday, June 3, 1:00 p.m. The East Village: Culture and Counter Culture: A Walking Tour with Joyce Gold From Stuyvesant's bouwerie to the Tompkins Square riot—an area rich in ethnic diversity. Joyce Gold, author of From Trout Stream to Bohemia: A Walking Guide to Greenwich Village History, will lead a tour highlighting the historic sites of the East Village. Many thanks to everyone who helped make today's Don't Demo Domino benefit a success. Despite the threat of rain, the bad stuff held off until the end, and we got to see The Black Tie Party, The Hungry Marching Band, Chesseburger, Vic Thrill (but no Saturn Missile) and the Wau Wau Sisters al fresco. Afterwards, everyone retired to the Brooklyn Ale House to catch an acoustic set by Nada Surf and enjoy some beer. Thank you one and all. 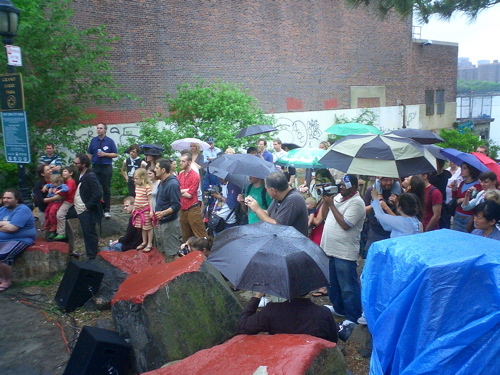 The crowd at Grand Ferry Park, watching Vic Thrill in the rain. The results? Over 850 people came to Grand Ferry Park and signed our Don't Demo Domino petition! These signatures will be added to the thousands who have already signed up to support preservation at the Domino site, and will help send the message to the Landmarks Commission and the City Council. Very special thanks to Mikki Halpin and Act Local, who not only put on a tremendous show, but did an amazing job of organization and overcame any number of unexpected turns. Mikki put this whole package together, including recruiting many of the volunteers. And thanks to all of the sponsors: SchofieldFilms, Brooklyn Brewery, Underground Press, the Brooklyn Ale House and Chiara Sullivan. Thanks too to all the volunteers who helped set up and clean up, and carried petitions in the rain, making sure that everyone signed on. And, of course, thanks to everyone who came to enjoy what started as a pleasant Sunday afternoon in the park. With the music and the crowds, it stayed pleasant, if not so warm and sunny. We have many more events planned in the near future, so please stay tuned. And if you have photos of the benefit today, please email us the links at wpa[at]waterfrontalliance.org. Thanks! We posted in a hurry last night, and left out a few key points. First, we completely forget to mention Butterfly Tech, the awesome sound techs who donated time and equipment (and made sure none of the talent was electrocuted in the rain!). As well, subtexture provided the great DDD graphics you see here. And Vic Thrill made it to Youtube (again, via GL). 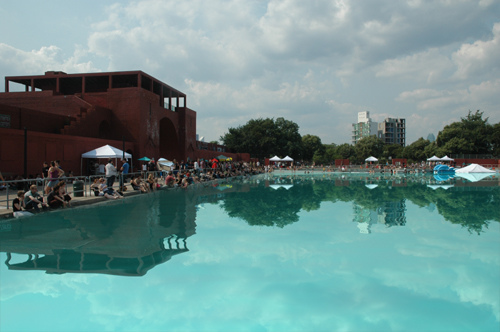 Sunday, June 10, 10:15 a.m. - 3:00 p.m.
NYC Parks will present their proposal for the redesigned McCarren Park Pool on Wednesday, 13 June at the Swinging Sixties Senior Center, 211 Ainslie Street (corner of Manhattan Avenue). There will be two sessions, one at 5:00 p.m. and one at 7:00 p.m. Sponsored by Community Board #1 and NYC Parks Department. Christopher St. ends at the Hudson River where recently designated historic districts and glassy apartment towers are transforming the waterfront. We'll examine the area's salty past, viewing structures associated with the neighborhood's mercantile origins, as well as the former Bell Labs complex, now Westbeth, and the West Village Houses. The tour ends whee the High Line, scheduled to open as a public park in spring 2008, begins. Leader: Matt Postal, architectural historian. Meet inside the park at Sheridan Square, at the intersection of 7th Ave. and Christoper St.
Thursday, June 21, 5:30 p.m.
Join us on a walking tour of Kleindeutschland, led by Paul Rush of “Dr. Phil’s Tours.” We’ll explore the area that was home to a thriving German community in the late 19th and early 20th centuries. Beginning at the Ottendorfer Library, the first circulating library in the city, we will also visit the former St. Mark’s church, home church of the congregation of the General Slocum disaster, Tompkins Square Park, among other sites. The tour will end at a German Biergarten for dinner (separate charge), Thursday evening, June 21, 5:30 pm. Pardon our lack of activity of late - we've been on an extended Summer schedule here at WPA. But not to worry, we have been busy. This weekend, WPA members Ward Dennis and Mary Habstritt will be leading a walking tour of Williamsburg & Greenpoint's Industrial Heritage for the Roebling Chapter of the Society for Industrial Archaeology. And, as these things happen, the Francis Morrone is also leading a tour of Williamsburg & Greenpoint for the Municipal Art Society immediately afterwards. 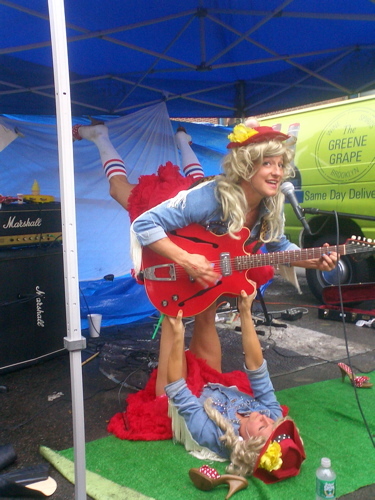 So this Sunday you can double your Williamsburg & Greenpoint historic pleasure! Sunday, August 19, 1:00 – 4:00 pm. 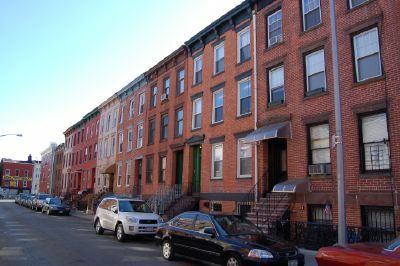 This neighborhood's industrial and social history, as well as recent efforts to preserve its historic buildings, will be explored on this tour led by Mary Habstritt, Preservation Committee Chair, and Ward Dennis, historian and member of the Waterfront Preservation Alliance of Greenpoint & Williamsburg. Sites along the way will include the Williamsburg Bridge, Domino Sugar, the Austin, Nichols & Co. Warehouse, remnants of American Manufacturing Co., once the world’s largest rope factory (aka Greenpoint Terminal Market), and Eberhard Faber’s pencil plant. These once-bustling working waterfronts lost most of their shipping and manufacturing after World War II, and now even the ghostly remnants of days gone by are being swept aside by a ferocious tide of gentrification, rezoning, and rebuilding as developers reshape these historic waterfronts into enclaves of posh housing. This tour, sponsored by the Municipal Art Society, will look at the current and future redevelopment, and search for the bits left over from the past--some deserving of landmark status. Leader: Francis Morrone, architectural historian. On Saturday, September 8 (September 9 if it's raining), all the architectural salvage dealers in the New York City area will be coming together in the school yard of PS 11 in Clinton Hill (at Washington and Greene Avenues) from 10 am to 4 pm to serve up a delicious array of old building parts, fixtures and lighting. Who will be there? 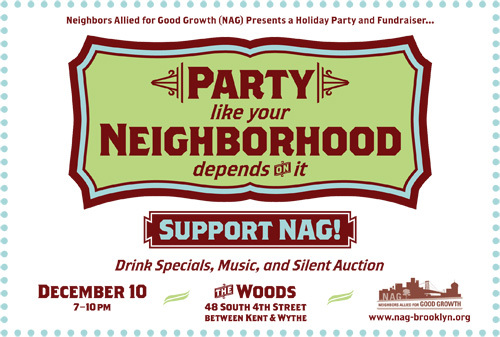 Williamsburg's own Moon River Chattel, Chelsea's (by way of Scranton) Olde Good Things, Harlem's Demolition Depot, Astoria's Build It Green, Clinton Hill's Eddie's Salvage, and Bed Stuy's Reclaimed Home; Philly-based Old Soul Architectural Salvage and Virginia-based Architectural Salvage News will also be in the house. In addition, Build It Green will have a drop-off station for recycling any odd building materials you may have lying around so bring over that box of tiles that's been taking up space in your basement since you finished you bathroom renovation five years ago! ... Admission is free—as are Brownstoner bumper stickers for the first 100 people to show up. A neighborhood pot-luck picnic in the streets complete with live music, games, raffle prizes, entertainment, free food and goodwill all day long! Please come out to join us. We will be joined by our friends from, Brooklyn Historical Society, Brooklyn Public Library, Lower East Side Tenament Museum, Coney Island Museum, The Gowanus Wildcats Drill Team with singer Renee Flowers, a performance by Kay Turner of Brooklyn Arts Council, live local bands, and more. BBQ's will be grilling all day and we encourage all potluck picnicers to come out and join us! Come out to meet your neighbors, appreciate our city, and show your support for your hometown museum, The City Reliquary! There will be a joint meeting of the Parks, Transportation and Waterfront Committees of Community Board #1 on Wednesday, 5 March 2008, to discuss the proposed Brooklyn Greenway initiative in Williamsburg and Greenpoint. WGPA urges people to come out and show support for bicycles and trees over parking spaces. Location: Upstairs room at Lady of the Snow Society Inc. (410 Graham Avenue, between Withers and Jackson). Closest subway: L train, Graham Avenue stop. McCarren Park has long been poised for a rebirth, and this meeting is an important step in ensuring that what happens to our park happens with our input. You use the park. You want it to be better. You’re not alone. Share your ideas on Monday March 3 (7pm @ Auto High Library). The best way to get the parks we deserve is through persistent community attention to each park. GWAPP (Greenpoint Waterfront Association for Parks & Planning) is helping kickstart a big (and sustained) Push for Parks all across our North Brooklyn neighborhoods to create (where one doesn’t exist) support (where one does exist) and unite (where, as with McCarren Park, several active groups co-exist) park-specific Friends Groups. This is the initial meeting of what, for now, might be called the United Friends of McCarren Park. With the improvements planned for McCarren Park's Pool/Ice Skating Rink and Skate Park, this is the time to plan for additional improvements throughout the entire McCarren Park. We need to make sure we have a unified and coherent voice in the way the park is maintained and plans are made for future developments. With the Pool reconstruction underway (design-wise at least) it seems the various user-groups of this potentially wonderful park have a shared purpose. Let’s use it to make the park better. Pool-adjacent “Comfort Stations” – can these be built first? Fieldhouse “Comfort Stations” – the most disgusting bathrooms in Brooklyn? Wading/Spray Pool – what can be done to have this running by summer? Everyone interested in working together to improve McCarren Park is welcome! Kevin Walsh of Forgotten New York will be at Word this Thursday to give a presentation on Forgotten Greenpoint. We're looking forward to this one. Kevin's talks - like his books, tours and website - are always interesting. PlaNYC 2030 is a broad initiative put forth by Mayor Michael Bloomberg to enhance New York’s urban environment for the future focusing on sustainable goals for land, air, water, energy and transportation projects. One of the main premises of the plan is that New York City will receive an additional one million residents in the next two decades. Many in the preservation community want to know how the city can accommodate this growth and still retain its historic character. Using the Mayor’s PlaNYC as a starting point, the Historic Districts Council’s 14th Annual Preservation Conference will focus on preservation and its relation to a broad framework of urban issues and how they relate to New York’s many diverse neighborhoods. The HDC conference will utilize original research, real-life case studies, panel discussions and community tours to talk about preservation and development in the future, especially through the lens of the 2030 Plan and its land use initiatives. In the aftermath of the Williamsburg-Greenpoint upzoning, the area immediately surrounding McCarren Park has undergone a drastic transformation. Once predominantly comprised of low-rise row houses and apartment buildings, the Park’s borders are now dominated by luxury condominiums built of materials and to a scale out of context with the rest of the neighborhood. Tour guide Ward Dennis (of WGPA) will highlight this severe new construction and how it’s affected surrounding areas. The tour costs $25 - register here. On Tuesday, April 8th at 1:00pm, the NYC Council Transportation Committee will hold an oversight hearing on G train service. The Council would especially like to hear from the G train's riders about their own experiences. We hope you can take the time to appear at the hearing, and speak out. If you can't attend the hearing in person, please consider submitting a written statement to us. Save The G will print and submit your statement on your behalf. Remember, in order for it to be official testimony for the record, you must include your full name and address. (We won't share this information with anyone but the Council members and their staff.) Please send the statement by midnight tonight to make sure we print & submit it on time for you. Oversight: What is the MTA doing to improve service on the G line? Resolution #1262 Calling upon MTA to immediately improve service on the G line and to not implement any service cuts. This is a major opportunity for G riders to speak and be heard; let's make the most of it! GWAPP is sponsoring a Push for Parks status meeting on Thursday, 17 April. "Find out what’s been happening with the newly formed parks groups and find out how you can get improvements on a park near you. On Wednesday, the first meeting of what, for now, is called the Friends of BIP (Bushwick Inlet Park) will be held at the Gutter Bar. 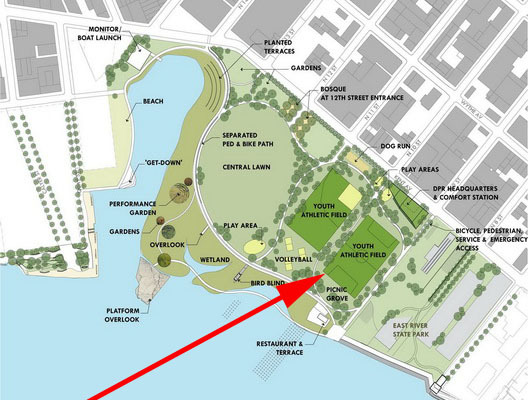 BIP is the new park that was promised during the City’s waterfront rezoning - it will be a 28 acre park straddling the Greenpoint/Williamsburg Waterfront, stretching from the State Park at North 9th Street to the northern side of the Inlet by Meserole Avenue. As GWAPP says, this park was promised to the community - come help make it a reality. 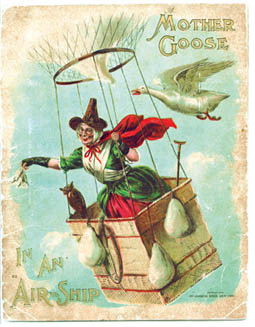 Mother Goose in an Airship, McLoughlin Brothers, 1909. At the turn of the 20th Century, south Williamsburg home to at least two of the country's largest printing houses. The larger of these was D. Appleton & Co., U.S. publishers of the Alice in Wonderland books and The Origin of Species, among many others. 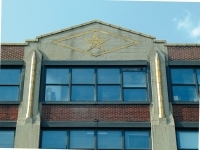 Appleton was located on Kent Avenue between Hewes abd Penn Streets; the building was taken down for the construction of the BQE. 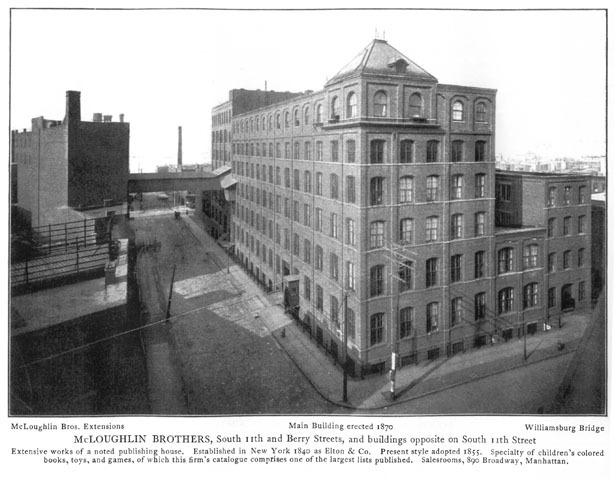 The second publisher - McLoughlin Brothers - was located on South 11th Street between Wythe and Berry. The McLoughlin plant was constructed in two phases - the original ca. 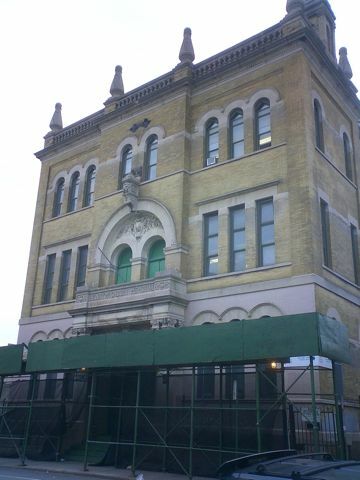 1870 building is located on the side of South 11th Street at the corner of Berry; the extension, constructed before 1900, is located on the south side of South 11th Street at the corner of Wythe. The red brick buildings still stand, their decorative sandstone or terra cotta trim still legible beneath a layer of flaking white paint. The extension still retains a mansard roof with iron cresting. A pyramidal roof which sat atop the corner pavilion of the original building has been removed, but much of the rest of the buildings are intact (and very rough around the edges). At the moment, the buildings are occupied as artists lofts (have been for decades, we understand) - that may be changing as the building is either changing hands or going through foreclosure. This exhibit highlights beautifully-illustrated children’s books, printed in Brooklyn by McLoughlin Brothers, a publisher who pioneered new technology and marketing techniques in the mass production of inexpensive children’s books... Visitors will see children’s classics, such as Alice in Wonderland and adaptations of Robinson Crusoe, educational books, such as The History of the United States in One Syllable, cautionary tales like those in the Little Slovenly Peter Series, ABCs, Mother Goose stories, Christmas Books, books teaching children how to paint or draw, along with games and puzzles. 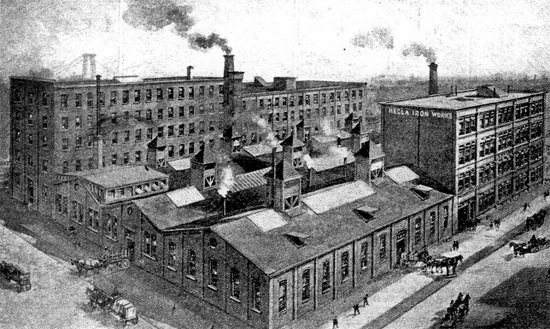 McLoughlin's success was largely due to the innovations in printing technology and inks that were developed at the South 11th Street plant. As a result of these innovations, McLoughlin was able to put out brightly-colored, visually stunning books and games for children at relatively low cost. As a result of its combination of skillful design, innovative printing and clever marketing, McLoughlin Brothers were practically synonymous with illustrated children's books and games. The company was bought by Milton Bradley in the 1920s, and all of the Brooklyn operations were relocated to Springfield, Mass. Current views of the buildings after the jump. 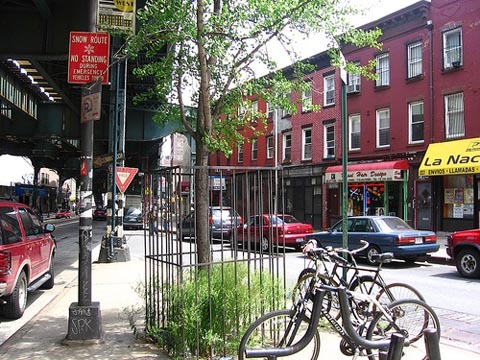 There are still a few spots available for the Street Trees Workshop in Greenpoint next Wednesday. Please see below info if you would like to participate! Wed. June 11, 7 p.m.-9 p.m. In this basic workshop, you'll learn to care for young street trees, receive free tools, and get a Parks Volunteer Permit, which will allow you to care for street trees and greenstreets. Advance registration is required; space is limited. To register, contact channaly.oum@parks.nyc.gov or (212) 676-1929 with your name and email and/or phone number. The workshop is hosted by GWAPP'S North Brooklyn Tree Project. This evening, City Lore and the Municipal Art Society are honoring 10 great places around the 5 boroughs for the ways they contribute to our communities and city. The event is also a celebration of the 10th anniversary of Place Matters, a project of the two organizations. This evening's event is sold out, but Place Matters has prepared the video above for those who cannot attend. The full list of honorees is below. Clearly for us, the highlight is the Greenpoint Manufacturing and Design Center, located on Manhattan Avenue and Newtown Creek. McCaddin Memorial Hall is the large yellow brick building on Berry between South 2nd and South 3rd. It is part of the complex of building on that block that belong to the Ss. Peter and Paul parish (the second oldest Catholic parish in Brooklyn). Historically, it served as the school building for Ss. Peter and Paul's parochial school (author Henry Miller was one of its students); lately it has housed a Head Start program, but little else. 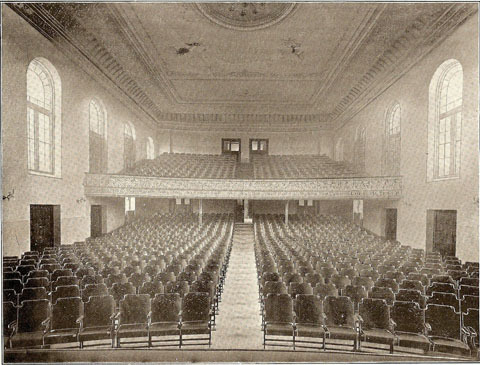 Which is a shame, since at the center of the building is the 600-seat auditorium seen below. Now, production company OperaOggiNY is reopening the hall for a performance of L'Oracolo, a one-act verismo opera by Franco Leoni. A 600 seat, "theater" complete with 50 foot proscenium arch raked stage and a balcony, plenty of fly space with classic brick and wood and plaster construction has been found and is about to be opened to the public by a collaboration between OperaOggiNY and the St. Peter and Paul parish. Rehearsals, started this week, are already bringing serious opera back to the theater. With Music Director, Bill Lewis, (coach to none other than the Met's Marcello Giordani and accompanist to all of Ronan Tynan's appearances) as part of the mix, these two very serious performers are preparing L'Oracolo, by Leone. Although presented within the last 2 years in a concert version in Manhattan, this is the first time that the work has been staged in an extremely long time. This one act verismo opera. composed by Leoni, who was a student with Puccini and part of Ponchielli's studio, will not disappoint. Set in San Francisco's China Town, cerca 1900, it was all the rage at the Met while Antonio Scotti was a star. Lend a hand - if you have a skill we probably need it! 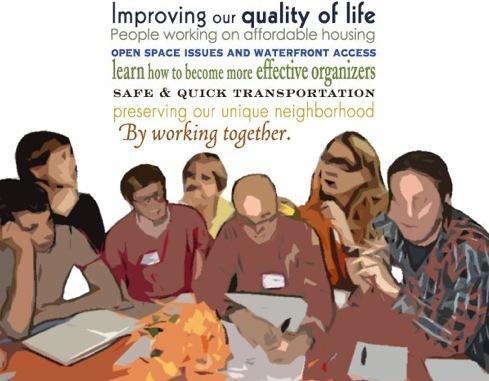 Artists, graphic designers, park lovers, neighborhood residents, writers, creative minds, community organizers and more! 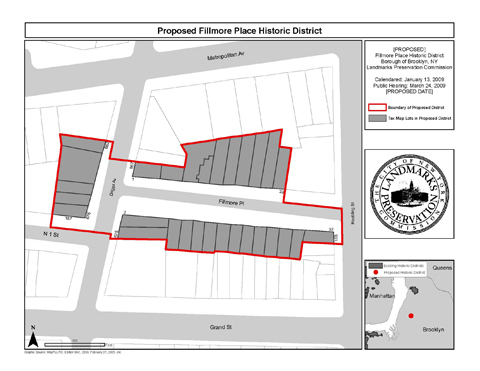 Mark your calendar - on 24 March the Landmarks Preservation Commission will hold a public hearing on the proposed designation of the Fillmore Place Historic District. We will post the exact time when it is available - stay tuned. 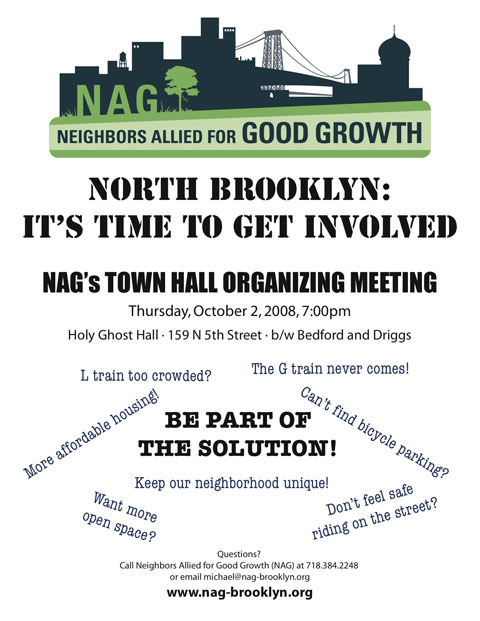 NAG (Neighbors Allied for Good Growth) has been doing a series of town hall meetings over the past few months, trying to get people engaged on different aspect of life and activism in Williamsburg and Greenpoint. One of the projects to come out this is the North Brooklyn Story Project, which seeks to compile an oral history of the neighborhood and its denizens. They're having a meeting for volunteers this week (Wednesday the 11th), in anticipation of a training session at Brooklyn Historical Society later this month. When: Wednesday, March 11th, 7 p.m. 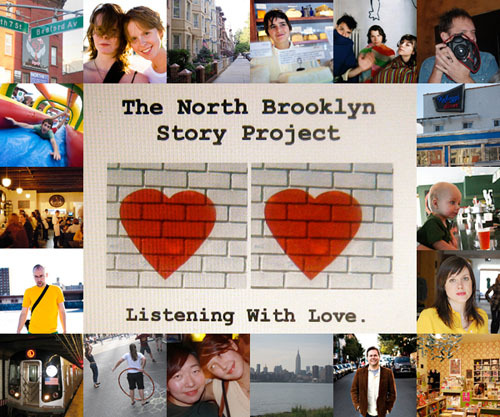 The North Brooklyn Story Project is looking for people with stories to share about our community, and people who can listen to and record these stories. Do you have a story to tell about life in Williamsburg or Greenpoint? A memory, a snapshot of life here today, an interesting interaction with community members? Do you know a neighbor or shopkeeper or friend with a story to tell? If so, you're invited to become part of the North Brooklyn Story Project. The first step? To find people interested in telling their stories and people interested in interviewing them. Together, interviewers and storytellers will create an archive of North Brooklyn stories that all of us can use to feel connected to our diverse neighbors and neighborhoods – past, present, and future. No special skills or equipment required – just ears and a voice. If you're interested, please come to the North Brooklyn Story Project Introductory Meeting, on Wednesday, March 11th, at 7 p.m. 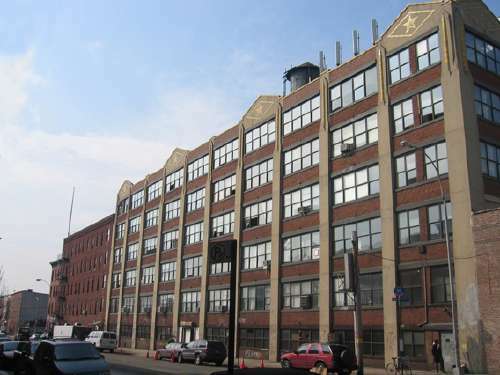 The meeting will take place at NAG headquarters (101 Kent Avenue at North 9th Street). At the meeting, we’ll discuss an upcoming training to be offered to our group by the Brooklyn Historical Society, as well as your ideas for making the project a success. For more information, please contact Gregor (g [dot] nemitzziadie [at] gmail [dot] com) or Rachel (rachtree [at] gmail [dot] com). Join the artist, Andrew Berrien Jones, in a discussion of the stylistic history of cast-iron architectural decorations and the preservation issues they present, with Richard Pieper, Director of Preservation, Jan Hird Pokorny Associates, Inc.; Diana Waite, expert on the ornamental ironwork of Albany and Troy and Trustee of the Preservation League; and moderator Alex Herrera, Director, New York Landmarks Conservancy. Co-sponsored by the Greenwich Village Society for Historic Preservation; The Institute of Classical Architecture & Classical America; and the New York Landmarks Conservancy. Light reception to follow. Reservations are required. Tickets are $5 for Museum members, Preservation League members, seniors, and students, $9 general admission. Order tickets online at www.mcny.org or call 212.534.1672, ext. 3395. The Museum of the City of New York is located at 1220 Fifth Avenue at 104th Street. Tuesday March 24 is a big day for the Eastern District at the Landmarks Commission. That afternoon, the Commission will be holding a public hearing on the designation of the Fillmore Place Historic District (pictured) in Williamsburg and on the designation of the Ulmer Brewery as an individual landmark. A related bonus hearing will be held on the Ridgewood Theater (sections of Ridgewood were historically part of the Town of Bushwick, so we'll lay a tenuous claim to the theater as part of the Eastern District). On Saturday, historian John Dereszewski will be leading tour of Bushwick Avenue from Graham to Flushing. This is the part of Bushwick Avenue that was the center of the original Bushwick settlement, but which later became part of the City of Williamsburg. Via Bushwick BK, which has all the details. First, Councilmember Diana Reyna, Esteban Duran & the Open Space Alliance for North Brooklyn are sponsoring & facilitating a community forum on North Brooklyn's open spaces, parks & neighborhoods. The event (celebrating Earth Day) will take place at El Puente, 211 South 4th Street (@ Roebling) in Williamsburg, at 6:30 p.m., and is open to the public. Second, Greenpoint Renaissance Enterprise Corporation (GREC) is hosting a meeting about the status (and state) of the Greenpoint Hospital. The City issued an RFP two years ago to redevelop a portion of this historic site. A number of proposals were submitted, but to date, no action has been taken. HPD will be at the meeting to give an update on the status of the RFP process and to answer community questions. 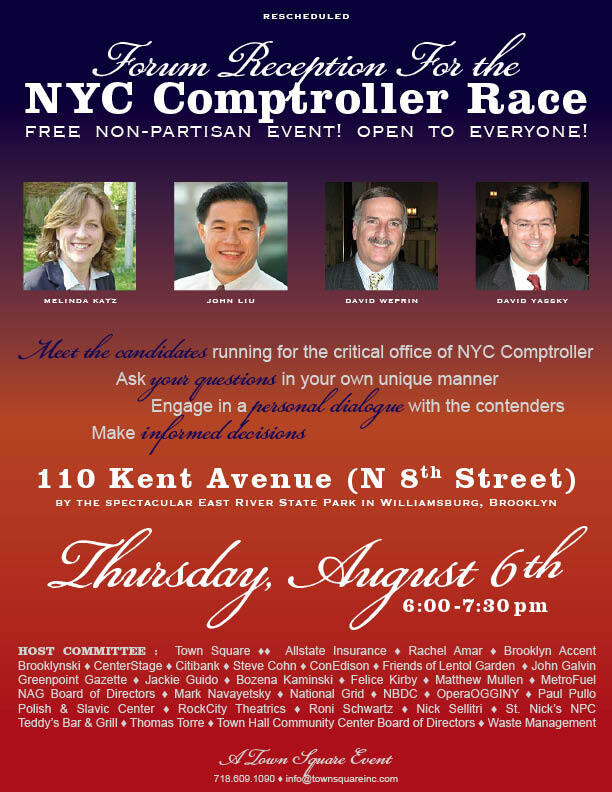 Also at 6:30, at the Swingin' Sixties Senior Center, 211 Ainslie Street (corner of Manhattan Avenue). 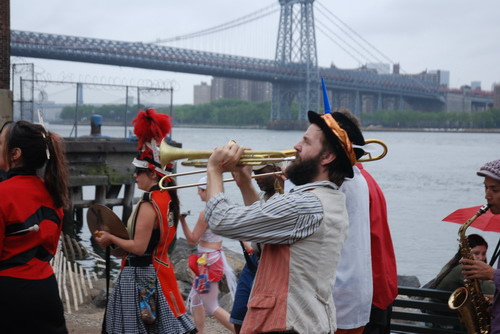 Williamsburg Walks is coming back for another year. This year it is being organized by L Magazine and NAG and will run for eight weeks in June and July. On Monday, there will be an informational meeting on the event. Recently, there has been press about some merchants whose business was hurt by last year's event. Williamsburg Walks is a good event, so we hope that the businesses sit down with the new hosts and figure out ways to make the event work better. 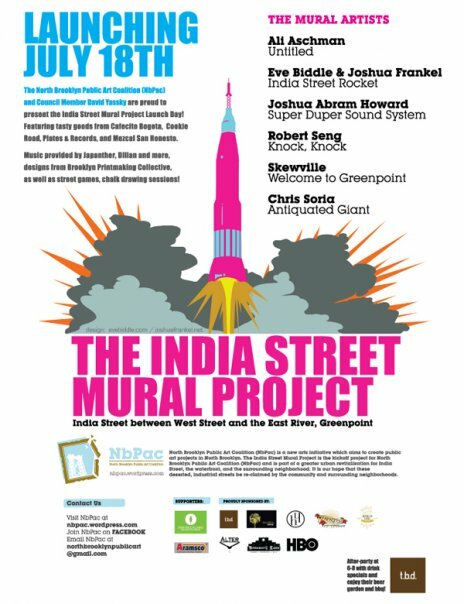 India Street Mural Project is complete, and they're having a party to celebrate. A day of art, music and food. 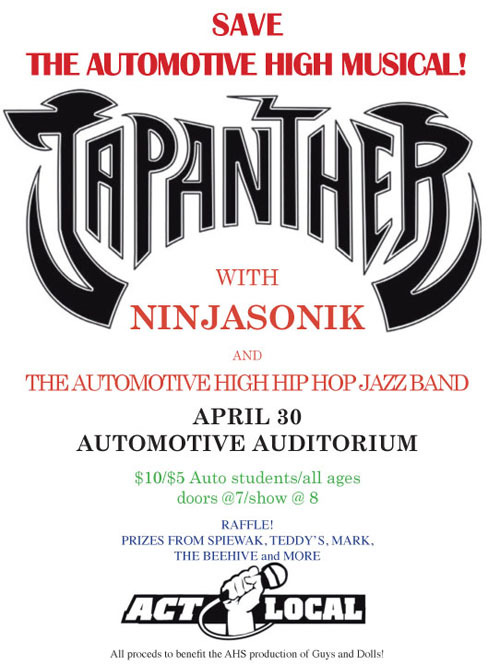 Music provided by Japanther, Dilian, Ninjasonik, Small Black. Food provided by Cookie Road, Cafecito Bogota, Green Pirate, Plates & Records. And an after party at t.b.d. with drink specials from 6-8. 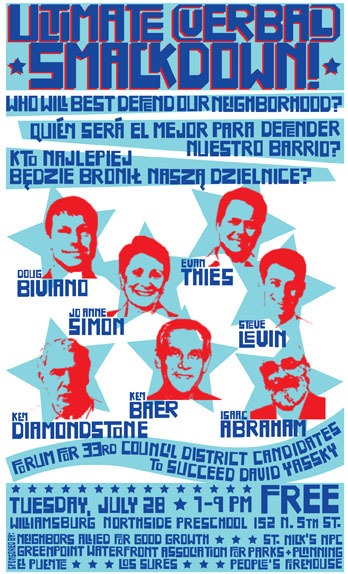 Tomorrow night, NAG will host a forum for the candidates for the 33rd Council District seat. You can submit your own questions for the candidates here. Come out tomorrow and hear what those would succeed CM Yassky have to say for themselves.